As I read the book, I realized that while there is a lot of power in asking different questions, the real strength of this exercise and others she describes is in giving employees the power to share their ideas – especially ideas we might normally call negative. It’s rare that we’re allowed as employees to attack our own companies, and it’s probably all too common that we think new ideas need to come from somewhere else. Why would we expect someone in finance to have a great product design idea, or a graphic designer to hold valuable insights about competitors? We generally wouldn’t, because we think too narrowly; we pigeonhole people based on any number of characteristics that end up stifling their potential to contribute to making a great company. 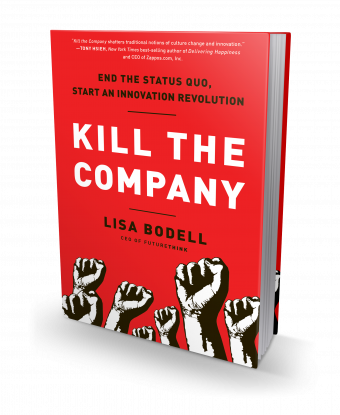 The points I’m making are not revolutionary to those that study innovation, but Bodell’s book offers a passionate perspective and is motivating even if what she has to say isn’t new to you. On the other hand, the book is full of practical tools that any group could use to evaluate just how innovative they really are, and to begin to instill innovation as a core capability that drives the culture of the company. I say “begin to instill innovation as a core capability” because, as Bodell points out, innovation is about small changes that gather momentum and shift the way a company and its employees see the world and operate over time. You can’t be a complacent company one day, go through an exercise or two, and wake up the next day an innovation powerhouse. Having spent some years in marketing, an industry that already thinks it is really innovative, I’ve seen first hand how inaccurate labeling can simply exacerbate the issue. Just because a company says it is innovative and creative does not mean it is; it is perhaps even more dangerous to be in this category because little to no effort is made to increase the innovation capability. I’ve also seen major change initiatives fail precisely because they were major change initiatives, and Bodell does a good job of explaining that not only are small changes the sustainable ones, but often stealthy changes are much more successful than loudly lauded efforts. This was a particularly interesting part of the book for me. I’ve long been an advocate of transparency in any business environment, and my first instinct was that stealth wasn’t transparent, but as I read on, it wasn’t long before I saw the wisdom in Bodell’s statements. The context matters, and stealth mode may be the only way to initiate grass-roots change in a larger organization, which will always be more effective than demanding change from the top. In large companies, especially those with a particularly negative or complacent culture, many people just flat out won’t believe that management is interested in change when the call to innovate comes from above – or, they’ll feel as though they’re just being asked to work harder. There are bigger gaps between the people in the trenches and company leadership, often marked by a lack of trust. In these cases, it makes perfect sense to assemble a core group of influential individuals and challenge them to start to change the culture from within. The key is to give them the support and tools they need. This book will teach you how to do that.